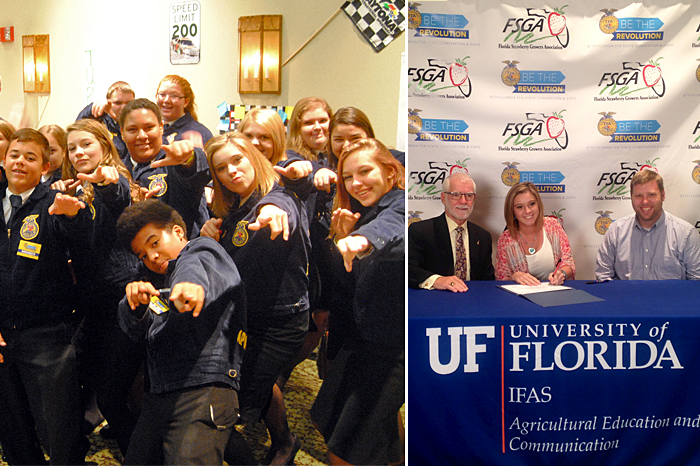 IN THE PHOTOS: Left, FFA youth ham it up during the 87th Annual Florida FFA State Convention & Expo. Right, Abby Crawford signs her letter of intent to teach agriculture after attending the UF Ag Education Institute session. THIS YEAR, THE THEME OF FLORIDA FFA was to become a part of the revolution. At the first general session of the 87th Annual Florida FFA State Convention & Expo, each state officer reported what their revolution was, what sparked their fire in the agricultural industry and got them involved in such an amazing organization. For some is the feeling of zipping up their FFA jacket for the first time, others it was the feeling of winning their completion after months and even years of studying. No matter what their revolution was, it all brought us there to that moment. During the rest of the time spent at convention, members had the options to attend student workshops geared toward becoming a team and becoming a part of the revolution, meet and greet with different agriculture colleges in Florida, attend general sessions, and more. The Warner University collegiate FFA chapter hosted a student workshop, on Thursday, called “started from the bottom,” which was led by Kaylee Norris and Allysia Raines (both seniors at Warner). At the workshop, we focused on qualities of a team and how to work together— not have one leader. The attendees were able to cooperate in two different team building activities. The first one, the members were separated into two different teams. Each team had to pick two people, one to be blindfolded and another to be the navigator. The rest of the teammates were asked to build obstacles with their bodies for the blindfolded member to go through. The point of this activity was to show how powerful communication is in a team. After we finished that exercise, we were then divided into four teams where we had to create a list of qualities that are essential in relationships, using each letter of the alphabet. Aside from workshops, Polk County FFA members seemed to have spent their time on the stage being recognized for their outstanding achievements! Almost every chapter was recognized for something that they had accomplished, whether it was the harvest change award, 100 percent membership, forestry, agriscience fair, prepared public speaking, creed speaking, and more. One course that a lot of our students attended was the “UF Ag Education Institute” class, which was hosted by Dr. Andrew Thoron. While in session, participants went around to different booths, which covered all things Ag Ed — from working with your alumni to getting accepted into college. The sole purpose of this class was to encourage students to go into the field and for those who are positively going into it, help them work on lesson plans and such. At the end of the night each participant was asked if they would like to sign a letter of intent. If you chose to sign the letter, you went into the media room where you signed a paper alongside your advisor and your new mentor that you received from the class. Aside from the educational experiences Florida FFA members were able to get, on Thursday night the members were able to break down and show off their dancing talent! The MEGA Party is what everyone was secretly excited about, I mean, think of all the awesome group “selfies” you can take! The 2014-2015 state officers did a fantastic job this year and lived by their theme. I cannot wait to see what the 2015-2016 state officers do, and I know without a doubt they will be incredible! Congrats to the new state officers!